Mmmmmmm... Taste of Almond Biscotti! 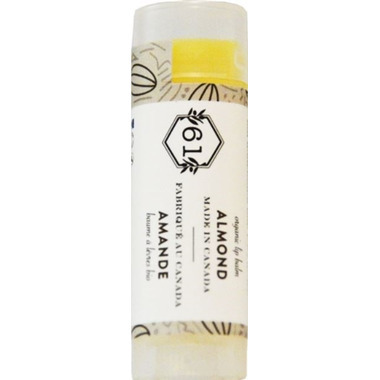 Crate 61 Organics Almond Lip Balm is drenched in sweet almond oil. The scent is wonderful (Marzipan! ), the ingredients are fantastic, but I really do not like how you can't get the last of the product out (you can't twist it up enough). There's not a lot of product to start with, and it's pricey compared to other lip balms (I know - those are crappy ones with chemicals, but, still), so I don't like that I can't get all the product out. But I gotta admit, the smell and quality is so great that that won't put me off probably repurchasing. Love this lip balm. I buy it about 3-4 years. Organic and a good price. All family use it, so I buy a lot. This by far my favorite lip balm! Itâ€™s smooth, not sticky and is super moisturizing. Iâ€™ve tried most of the flavours and almond is the best for me! This lip balm is absolutely divine! It smells and tastes just like marzipan, which I absolutely love. It is very sweet, which I adore, but others may not. The oval shaped applicator is unique and is great! It makes my lips so soft. So far this one is my fave! I like the texture of this lip balm and that it is pretty moisturizing. Feels good and smells amazing. I looove marzipan and this just smells like marzipan. I love the product but I am not fan of the applicator and its shape. It is only a small inconvenient but I would love this lip balm much more if it came in a traditional round applicator, which I find more comfortable on the lips. It will not deter me from buying this though, as I am a big fan of this brand in general. Applies on smooth and great smell ! I love this companies lip balms and the price is fantastic! The almond is nice. I have almost all the flavours.